Choosing the correct paper is of paramount importance to any watercolour artist. A good watercolour paper will be durable and able to withstand multiple washes, be non-yellowing, sufficient in weight and consistent in its texture. It must be the perfect 'blank canvas' on which to create your painting. Picking the correct watercolour paper can have a great impact on the appearance of your watercolour painting. 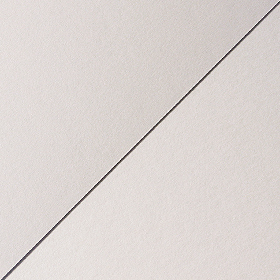 At first glance, choosing your paper can be a little overwhelming as there are so many different types available with vastly different specifications. Here you can find a comprehensive guide to the terms you will encounter to help you navigate your way through the world of watercolour paper. This is the smoothest watercolour paper available. During its manufacture, a Hot Pressed Sheet is pressed between hot rollers to provide its signature smooth finish. The smoothness of the surface makes it an excellent choice for those who want to achieve fine details in their paintings. As the surface is so smooth it would not be the ideal choice for artists who want to make the most of the granulation of their watercolour paints. Illustrators or Designers who require a flat finish on their artwork for accurate reproduction commonly choose this surface. 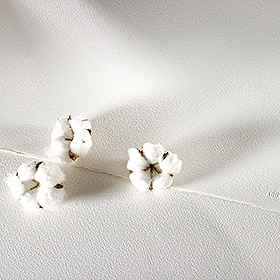 A Cold Pressed sheet is sometimes known as NOT, which derives from the phrase 'not hot pressed'. 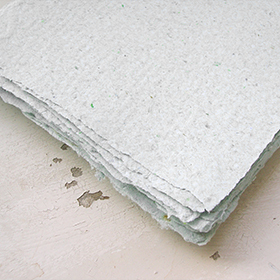 This type of surface is made by taking a Rough sheet and pressing it through the paper press but without using the felt. 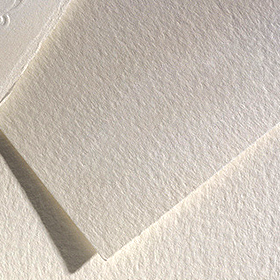 The surface of Cold Pressed Paper is slightly textured and overall is quite popular as it suits a range of techniques and applications. Rough Watercolour Paper is the same as its name suggests. This surface is created by pressing the paper between the felts on the paper making machine. 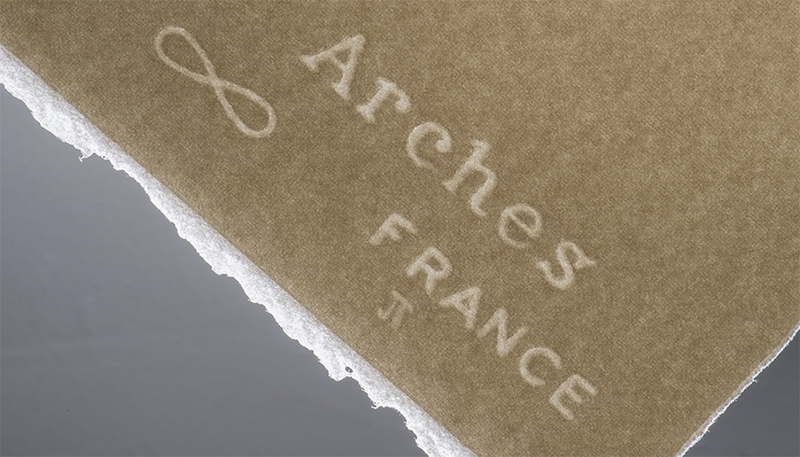 The texture of the felt is embossed into the paper sheet, giving it its signature rough texture. A Rough sheet gives the greatest texture which can enhance certain types of watercolour work. Those looking to create landscapes and seascapes may choose a rough surface as the pigment from the paint will settle into the pits of the paper to create highly textured washes. It is also a great choice for expressionist techniques. Which side of the paper do I use? Although either side of Watercolour paper can be used to paint on, it is generally accepted that the correct side on which to paint is the side from which you can read the watermark. This side will be the 'Felt Side' and should noticeably have more texture. You will notice that the reverse side will have less texture, as this side will have been in contact with the mesh of the cylinder mould. In the image above you can see that the watermark is the right way round and therefore easily read, indicating that this would be the correct side on which to paint. 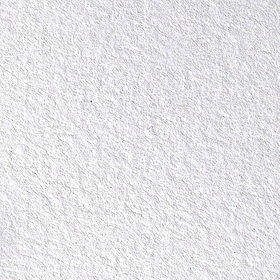 There are many different qualities of Watercolour Paper available, but in general you will be able to distinguish between student and professional quality papers based on what the paper is made from. 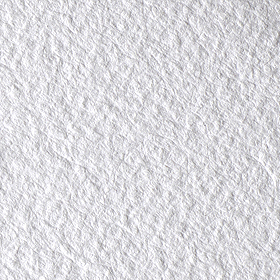 Watercolour Paper can be manufactured from wood pulp, cotton or a mixture of the two. Some new watercolour papers are manufactured from Bamboo, such as the Hahnemuhle Bamboo Mixed Media Sketchbook. As a papermaking material Bamboo is highly sustainable and is considered an environmentally friendly paper type. 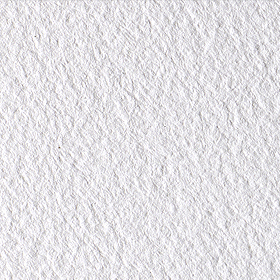 Known as 100% Cotton or Rag paper, the highest quality watercolour paper sheets contain cotton, which offers watercolour artists incomparable stability and archival qualities. There are papers available that are made from a combination of both cotton and wood pulp, which provides a compromise between quality and affordability. A more economical alternative to 100% Cotton Watercolour Paper is Wood/Cellulose based Watercolour Paper. This type of paper is made from chemically treated wood fibres and is only available in a NOT/Cold Pressed Surface. Winsor & Newton Classic Watercolour Paper, which is a replacement for the old Cotman Watercolour Paper, for example, offers excellent value for money and is acid free and surface sized. 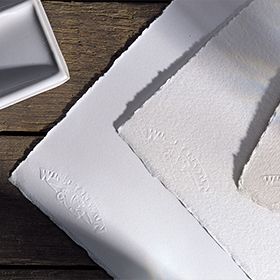 As the name suggests, the handmade watercolour paper manufacturing process is done entirely by hand. The paper is made sheet by sheet in a paper mould, rather than in a continuous sheet on a roll. This process produces four characteristic and genuine deckle edges. Some artists may favour a handmade watercolour paper as the surface texture is more pronounced and can be used to create interesting painting effects. Mould-made Watercolour Paper is made on a Cylinder Mould Machine. The consistent texture of mould-made paper makes them a desirable choice amongst artists. These machines are quite rare and special, and mould-made papers are known for their heavier weights, impressive watermarks and superior surface stability. Producing paper on a Cylinder Mould Machine is the closest you can get to mechanising the handmade process, but has the benefit of more consistent paper surface which does not happen with handmade paper. With this method the paper fibres lay randomly across the sheet which makes it much more dimensionally stable than a Fourdrinier made paper. Fourdrinier or Machine Made Watercolour Paper is a papermaking process whereby the paper is manufactured in a continuous sheet on a wire belt. It was named after the Fourdrinier brothers who financed the first operational paper machine. With Fourdrinier made paper over 50% of the paper fibres align themselves with their lengths parallel to the Grain/Machine direction. Having the fibres in alignment in the same direction means that machine made paper is not as stable as mould-made paper. Machine made paper will not have a natural deckle edge and the surface of the paper will appear more uniform and mechanical. Watch this video above and see the manufacturing process behind some of your favourite watercolour papers, Saunders Waterford and Bockingford. These papers are made at St. Cuthbert's Mill, which sits nestled in the Mendip Hills in Somerset, England. Ideally placed, the mill makes use of the pure waters of the River Axe for their paper making processes. With the 100 year-old cylinder mould machine, one of the few left in the world, master papermakers produce beautiful papers with stunning texture and excellent surface stability that are used by artists and photographers world-wide. When you are choosing a paper you will need to make sure that the paper is Acid-Free. This is essential as it ensures that, in the long term, your painting will maintain its colour without yellowing and also will not become brittle with age. Acid Free paper is manufactured by using fibres that are free from acidic elements, which are treated with a neutral sizing system. Gelatine, a substance derived from animal collagen, is used to size Watercolour Paper. Gelatin sizing produces just enough resistance so that the paint does not fully absorb into the paper, but instead only lightly penetrates its surface so your paint stays bright on the surface of the paper. Paper can be both internally and externally sized. Internal sizing occurs when the gelatin is added to the paper pulp before it has been pressed. This ensures that the paper does not become more absorbent if the surface is disturbed in some way, for example when scratching or scrubbing. External sizing is applied by soaking in a gelatin bath once the paper has been made. Artists' quality watercolour papers are coated, or surface-sized with Gelatine in addition to internal sizing to provide the right balance of absorbency. Sometimes you may find that the paper has been too heavily sized. This is apparent when the paper resists the paint more than it usually would, causing the paint to form little bubbles on the surface. If so, it's easy to remove any excess sizing by soaking the paper in a water bath and leaving to dry once excess water has been removed. Although gelatine is commonly used for sizing, other alternatives may sometimes be used. The use of Gelatine means that some watercolour papers will not be suitable for vegetarians or vegans. Papers that use a gelatine substitute would be suitable. Bockingford Watercolour Paper and Fabriano Artistico Watercolour Paper are both suitable for those wishing to avoid using animal products in their art supplies.